I do most of my movie watching via Netflix, tossing random titles into my queue as I come across intriguing reviews or recommendations. Since my queue is longish, compared to my viewing rate, by the time a movie shows up in my mailbox, I’ve generally forgotten what it’s about and why I picked it. Every so often, I come across a small movie that exceeds my expectations (such as they are), and I suppose that’s one of my favorite movie-watching (or play-going, for that matter; see my Bach at Leipzig post from a few days ago) experiences. When an Egyptian police brass band travels to Israel to play at the opening of an Arab arts center, they wind up abandoned and lost in a remote desert town in this charming cross-cultural comedy. Defying expectations, the tiny Israeli community embraces the musicians, and both the Egyptians and the locals learn a few things about one another — and themselves — in this witty winner of the Cannes Film Festival Un Certain Regard prize. The Israel of “The Band’s Visit” is one in which God has pushed the pause button. Set in a small, out-of-the-way desert town called Betah Tikva — a development that appears to have stopped developing from sheer inertia —Eran Kolirin’s debut film is about the comedy and tragedy of the things that separate people: borders, religions, languages, loneliness. It’s a small, profoundly satisfying movie that keeps echoing long after it’s over. 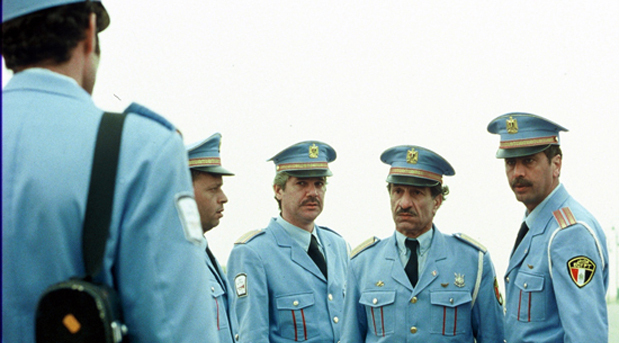 In a sort of cosmic joke, an Egyptian police band has arrived in Betah Tikva, its eight members uniformed in powder blue and utterly at sea. They’re supposed to be in Petah Tikva to play at the opening of a new Arab Cultural Center but they got on the wrong bus. There’s no cultural center in Betah Tikva. There’s no culture or center, either. There’s only an apartment high-rise, a cafe, a public phone, and locals who’ve long since given up trying. The appearance of Arabs bearing tubas and ouds is a welcome dash of the surreal. Go watch it, and then come back and thank me.